Enter once more the world of Roland Deschain—and the world of the Dark Tower...presented in a stunning graphic novel form that will unlock the doorways to terrifying secrets and bold storytelling as part of the dark fantasy masterwork and magnum opus from #1 New York Times bestselling author Stephen King. “The man in black fled across the desert, and the gunslinger followed.” With these unforgettable words, millions of readers were introduced to Stephen King’s iconic character Roland Deschain of Gilead. Roland is the last of his kind, a “gunslinger” charged with protecting whatever goodness and light remains in his world—a world that “moved on,” as they say. In this desolate reality—a dangerous land filled with ancient technology and deadly magic, and yet one that mirrors our own in frightening ways—Roland is on a spellbinding and soul-shattering quest to locate and somehow save the mystical nexus of all worlds, all universes: the Dark Tower. 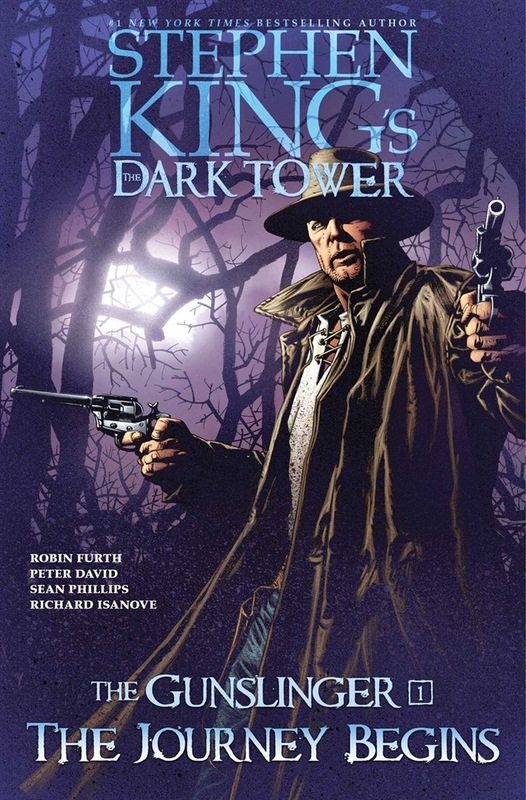 Now, in the graphic novel series adaptation Stephen King's The Dark Tower: The Gunslinger, originally published by Marvel Comics in single-issue form and creatively overseen by Stephen King himself, the full story of Roland's troubled past and ongoing saga is revealed. Sumptuously drawn by Richard Isanove, Sean Phillips, Luke Ross, and Michael Lark, plotted by longtime Stephen King expert Robin Furth, and scripted by New York Times bestselling author Peter David, The Gunslinger adaptation is an extraordinary and terrifying journey—ultimately serving as the perfect introduction for new readers to Stephen King’s modern literary classic The Dark Tower, while giving longtime fans thrilling adventures transformed from his blockbuster novels. The barony of Gilead has finally fallen to the forces of the evil John Farson, and the surviving young gunslingers were massacred at the decisive Battle of Jericho Hill. But one has risen from the ashes: Roland Deschain. Now as the last of the gunslingers, Roland sets out in search of the mysterious Dark Tower—the one place where he can set the events of his out-of-sync world right again. Along the way, Roland will battle forces from his worst nightmares as he trails the elusive Man in Black—the inhuman sorcerer who holds the key to Roland’s desperate search. Acquista The Journey Begins in Epub: dopo aver letto l’ebook The Journey Begins di Stephen King, David Peter, Robin Furth ti invitiamo a lasciarci una Recensione qui sotto: sarà utile agli utenti che non abbiano ancora letto questo libro e che vogliano avere delle opinioni altrui. L’opinione su di un libro è molto soggettiva e per questo leggere eventuali recensioni negative non ci dovrà frenare dall’acquisto, anzi dovrà spingerci ad acquistare il libro in fretta per poter dire la nostra ed eventualmente smentire quanto commentato da altri, contribuendo ad arricchire più possibile i commenti e dare sempre più spunti di confronto al pubblico online.